Don't overlook the importance of your process' muffle furnace. Anyone can build a furnace, but only MHI's furnaces feature industry leading temperatures and efficiencies. A unique combination of FiberFree™ Refractories and MHI's patented Molybdenum DiSilicide and GAXP™ elements allow our muffle furnaces to operate at higher temperatures and greater efficiencies than other furnaces. FiberFree™ Refractories - Years of R&D have gone into making FiberFree™ Refractories one of the highest performing refractories in the industry. The foundation for an efficient furnace is keeping the heat where it belongs- inside the furnace. GAXP™ and MP Heating Elements - Element surface temperatures of 1900°C allow MHI's muffle furnaces to reach operating temperatures up to 1800°C. Integrated Safety Features - Standard safety include a double walled, cool to the touch shell and the highly acclaimed 3-arm safety swivel door, helping reduce the danger associated with opening and closing many furnaces. High Uniformity - Advanced designs allow our muffle furnaces to have excellent uniformity. ±1°C or less in most cases. Whether you are drying, curing, preheating, melting or a number of other processes, chances are MHI has a muffle furnace suited for your application. To find out how an MHI designed and built muffle furnace can facilitate your process, visit the links below for more information or just contact us by phone (513.772.0404) or contact us online. 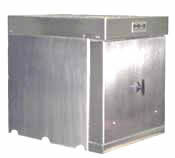 For more information, see Box Furnaces or Request a Quote.